Hey S & J, We recently welcomed our first child into the world, Everly Harper. 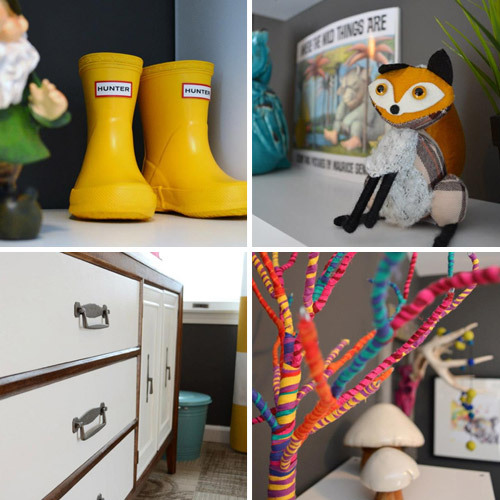 Before we even knew Ever (that’s what we will lovingly call her), we knew we didn’t want a typical nursery for her – and we definitely didn’t want anything close to what the room looked like when we bought the place. My wife was inspired by a woodland themed nursery that we found through your site years ago, and the following is what we came up with. We knew we wanted to save money where we could, and we both love a good project, so we tackled whatever we could on our own over the last few months. We started by painting the walls with Behr Ultra Premium Plus Flat Enamel (color-matched to the Sherwin-Williams color Grizzle Gray ) and then hand painted the birch trees in some leftover trim paint (Behr matched to Sherwin-Williams Extra White). We covered the old half hardwood / half painted subfloor with carpet tiles and then layered the white shag area rug from Target over that. The curtains and hardware are from Ikea, but we ended up hand painting those yellow stripes (Yellow Gold in Behr U.P.P.) because we couldn’t find reasonable yellow curtains that we loved. The changing table/long dresser is a vintage dresser (thanks Craigslist!) that we sanded, and then stained, painted and polyurethaned. We added the changing pad frame and insert (Pottery Barn kids) which can later be removed so she can grow up with the dresser. The crib is new from Walmart.com. 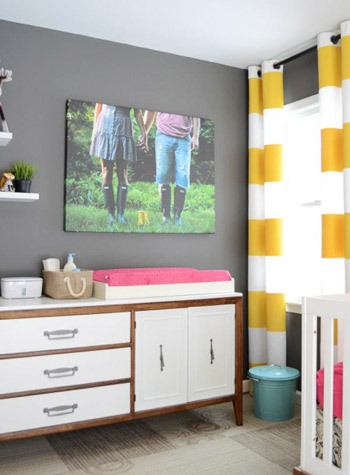 The canvas on the wall is actually vinyl that we had our birth announcement photo printed on. I built a frame out of leftover lumber and stretched the vinyl like I would stretch a canvas. The local company that printed it for us is PrintLeader, based in Buffalo, NY. The photo itself was taken as part of a “Trash the Dress” shoot we did with our favorite photographer Erin Oveis Brant. We found out a few weeks before we had planned to shoot a five year wedding anniversary gift to ourselves that we were pregnant, so we asked Erin if she could incorporate some pregnancy announcement photos into our day. She was actually the first person we told, and those boots were our first purchase for the baby! The Hunter boots are now a part of the décor until she herself can kick up a little mud of her own! Most of the other accessories have been collected over the last 10 months – like a fox and mushrooms from Target, a fabric wrapped tree from Anthropologie, and a diaper pail from Ikea. We love not only how this room looks, but all of the awesome thought that went into it. Everly is a lucky lady. 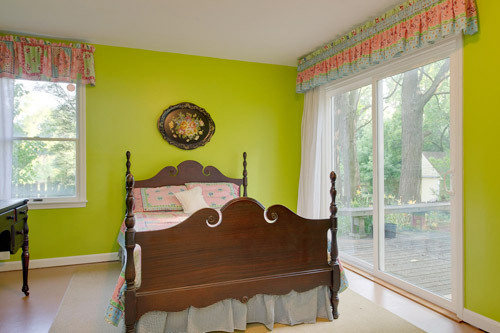 And if you want to see more, Dave and Carrie have a photo album that shows off more corners of this colorful “woodland” room. Thanks for sharing guys! What an awesome nursery! I especially love the birth announcement canvas! I love the room. I am thinking of painting trees in my bathroom redesign and was wondering if you had more information on how to paint them. I have found some wall stickers on eBay but have not heard much info from others on using them. Anyone have tips for Rita?